The fact remains that it is representative of real world software (whatever quality it is) and is used by many. "You should be aware that Cinebench 11.5 is using Intel openMP (libguide40.dll), which does not support AMD-NUMA"
So while Cinebench is a valid bench as quite a few people use the Intel OpenMP libraries, it is not representative of all render engines. In fact, Cinebench probably only represent the smaller part of the market that uses the Intel OpenMP API. On dual CPU systems, the Opteron machines run a bit slower than they should; on quad CPU systems, this lack of "AMD NUMA" awareness will have a larger impact. We did not expect that the latest Opteron would outperform the previous one by a large margin. Cinebench is limited by SSE processing power. The ICC 11.0 compiler was the fastest compiler of its time for SSE/FP intensive software, even for the Opterons (up to 24% faster than the competing compilers), but it has no knowledge of newer architectures. And of course, the intel compiler does favor the Xeons. If you think being used in a movie = widely adopted you are in the wrong. Mental Ray, V-Ray, Blender, Maxwell. Now those are widely adopted renderers, and they really push the hardware to the limits (as shown when silly CB showed 8% gain from IB to HW, yet those renderers showed more like 20% gains). So let me put it straight: CB is a garbage benchmark, a bunch of scenes rendered in some movie wont make that untrue. AMD was able to manage some very solid IPC gains. Too bad they weren't able to build Kaveri on a process that is more focused on higher clockspeeds. Kaveri at the top Richland clocks would be a quite the budget performer. So why won't they release an FX lineup based on steamroller cores? I still think its not a bad move because these new cores do bring some incremental performance/efficiency gains. Or is the business case for it just not worth the risk? Thankfully AMD stopped competing with itself, releasing an FX processor would be sending the wrong message. The whole point was to use the new density optimized process node for graphics and HSA. Imagine trying to sell an 8 core CPU that is overall slower and lower clocked than the previous iteration, on the premise that it has gotten a wee bit more efficient, while the competition crushes you in terms of clock for clock efficiency. Looking at reviews I can't see 20% gains IB to haswell. I see gains pretty much in line with general performance. Cinebench is pretty much in line with expectations. Slightly weaker FPU and lower clock speed hurt singlethread. Reduced MT penalty help multithread. AMD has been defocusing on FPU performance since Phenom II and it shows. 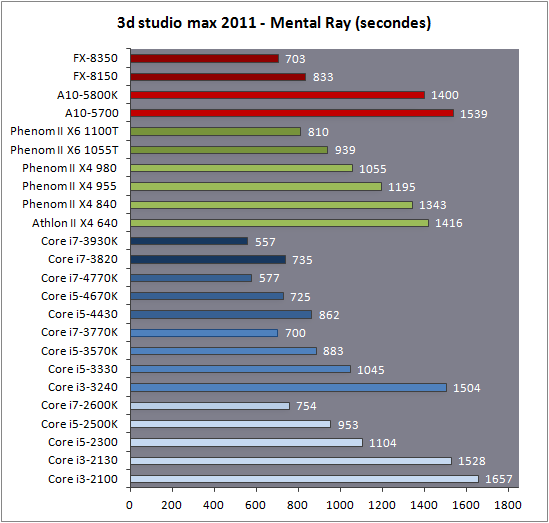 Cinebench R15 showed a large increase going to haswell. Thats nice and I truly didn't know that but that seems to be a problem with dual CPU designs which is out of context. And regardless of the utility value cinebench, as I said before, is based on real world software, making it different from wprime, superpi, etc. No one is going to be doing serious rendering on a kaveri build anyway, you get a much stronger CPU for that. Mental ray (even this one is even more widely adopted than C4D): 20% gain. V-Ray (1# in the viz sector): 4770K as fast as 3930K! Note: C4D has plugins for those render engines. I see what you mean but R15 showed those same gains. Some reviews have more, some have less. If you want to remove cinebench then fine. But it is somewhat/decently relevant. Much more so than wprime. CB single is also the only ST test in SA's list which becomes moderately important considering the failure to improve IPC to any reasonable degree. Ok so you take away the wprime and you are at 7.7% (taking into account Cinebench odd results). That's not bad at all considering the fact that many workloads stress the shared FP units which didn't change for the better (but for the worse as one MMX pipe is gone). You know what wouldn't be bad at all? A +30% IPC boost. According to your own words ~10% better performance per clock in legacy apps (without clock regression, IB -> Haswell) is ''pretty disappointing'' so I'm not sure how 7.7% better IPC with clock regression (comparing the fastest SKUs) can be considered a success. Strange logic here. 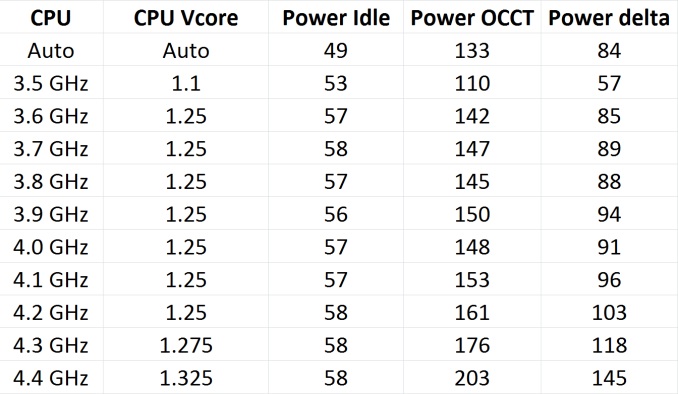 According to your own words ~10% better performance per clock in legacy apps (without clock regression, IB -> Haswell) is pretty disappointing so I'm not sure how 7.7% better IPC with clock regression (comparing the fastest SKUs) can be considered a success. Strange logic here. so yes , no frequency regression but a perf/watt regression. They are working, check your connection. You know why they add support for other renderers? The same reason 3dsmax does even they have the scanline renderer (hint: its not because it is particularly good at rendering). CB is to rendering as Wprime is to general calculation software. No, they aren't. They didn't work the last time I saw you try to directly link images from hardware.fr either. The big difference is that Haswell brought an IPC gain and performance with higher power consumption than IvyBrindge. Kaveri brought an IPC and performance gain with substantial lower power consumption. Yes Haswell used the same 22nm as Ivy and Kaveri is using 28nm but the end result is the same. At the same clocks as their predecessors both Kaveri and Haswell bring an IPC gain on average. Isn't that down to the 28NM node?? That chart is a bit pointless too as we would need a direct comparison with an A10 5800K and a A10 6800K,and probably usage of a couple of samples too. Just basing it off one sample alone is not really any use TBH as there is sample to sample variation. Moreover,most of the gains with Haswell were down to improved idle power consumption and the chipset being made on a newer process node. The latter alone was a major contribution to keeping power consumption in check. Really ?? where are Richland numbers to compare the two ??? Kaveri 7850K has the same performance as Top End Richland APU at lower power consumption. At the same power consumption its performance will be higher than Richland. I dont know how you came to the conclusion that at the same clocks it will have higher power consumption than Richland. I dont know, maybe at 5GHz Kaveri may have higher power consumption than Richland, but that is irrelevant. We are always compare at default frequencies. Since we only have Desktop Kaveri numbers I was only evaluating desktop AMD and Intel SKUs. When we will have Kaveris Mobile numbers we can also talk about them as well and compare them. Even though Kaveri doesn't blow our socks off in terms of performance, it's power efficiency is undoubtedly better when you compare the 6800k to the 7850k. I do have to admit though, the 45, 65w, 95w TDP designations for the new Kaveri processors seem strange given their actual power draw. TDP is not a power consumption number, but obviously everyone is not yet clear what is TDP. Pretty much summons its up. Kaveri is a flop CPU wise, yet the spindoctors are at work. Even without the clock regression, it would still put AMD even further behind Intel. And later this year Kaveri will have to face 14nm Broadwell in the mobile segment as well. I cant imagine any success for AMD there as some hope for. TDP. Thermal Design Power. The thermal design power is the maximum power a processor can draw for a thermally significant period while running commercially useful software. The constraining conditions for TDP are specified in the notes in the thermal and power tables. The 1-3W saved on the chipset with Haswell was not the reason. The major change was the FIVR and an uarch designed for the process node. AMD had to lower the "simulated" estimates for Kaveri down. Remember, 4Ghz base, 900Mhz GPU boost? It ended as 3.7Ghz and 720Mhz GPU boost. I doubt the 28nm is to blame. But rather the SR-B cores. The question is, why wasnt SR-A good enough. TDP is defined as an average power draw over a (defined) period of time, not as peak power consumption. I find it strange you had the exact definition in front of you yet decided to leave out an important part. [Later Edit]However, TDP can be used to define maximum power consumption in certain scenarios where the chip is stressed for a long period of time. The chip needs to stabilize to that value in order to meet the cooling specifications. This is only valid for chips which have very accurate TDP ratings. (some CPU models are given a TDP rating which they'll never reach in actual power consumption). no. http://en.wikipedia.org/wiki/Thermal_design_power TDP is not average power consumption. Yes, I was just talking about big core. But it doesn't seem like AMD is having much success yet with Jaguar based implementations outside of consoles yet. The money they put into ARM development would have been better spent on x86 in the short run, IMHO. Long term, I don't know - AMD is in a tough spot wrt x86 DT/Mobile and facing an battle royal for ARM based servers. I wouldn't want to be R. Read. I realize I will probably receive some hate for this in this community (we love our big fast CPU cores a little more than the general population), but are we certain there is that much long-term future in big cores? If more applications start taking advantage of OpenCL/HSA then that gives an advantage to the CPU with more transistors dedicated to the GPU. Additionally, the desktop market is shrinking and small cores take over more of the mobile market each year. If ARM and Avoton take over a large portion of the server market and HPC is dominated by GPUs how much market does that even leave for genuine big cores? Is it even enough to fund development of new big cores for Intel? For AMD? I've seen speculation that AMD doesn't even have a big core planned after Excavator. Is the future of computing a team of small cores aided by a GPU and high-end CPUs merely being made up of more small cores / bigger iGPUs? AMD calls average TDP for ACP. TDP is and will be TDP. The problem is the limited usage of the GPU. STREAM, CUDA, OpenCL, etc havent moved that barrier. Small cores only serve a limited usage. In the consoles you already see games capped at 30FPS due to that. And AMD cant bet on big cores, because they cant afford them. Its all about R&D there. HPC and small cores is a super tiny amount of the server segment. And the first ARM server designer went belly up. Actually it is yes, but you are the second one to leave out the significant part in a sentence: "average power draw over a (defined) period of time". Time is very important here, and somehow all people read is "average power". - If the CPU uses 1KW in extremely short bursts, then the OEM needs to design a 11W TDP cooling solution. - If the time window the CPU spends at 1KW is a thermally significant period, then the OEM needs to... design a 1KW TDP cooling solution. In both cases the average power consumption is 11W, peak power consumption is 1KW, but the average power consumption in a relevant period of time can lead to either 11W TDP or 1KW TDP.